"When [Jack] Kerouac died in 1968 at the age of 47, he was a broken alcoholic, his literary reputation so depleted he was unable even to find a paperback publisher for his last novel, Vanity of Duluoz," writes The Telegraph. “Unsure of what value to put on his estate, the bank valued it at a nominal $1. Over the years, it would rise to an estimated $20m." As The Telegraph goes on to describe, the Kerouac estate started generating its wealth when, during the 1990s, feuding relatives, exercising questionable authority over the writer's literary remains, began auctioning things off. The original manuscript of On The Road was sold to James Isray, owner of the Indianapolis Colts, for $2.43 million. Johnny Depp paid $50,640 for Kerouac’s raincoat, tweed overcoat and other personal belongings. And photos were licensed off to corporations. 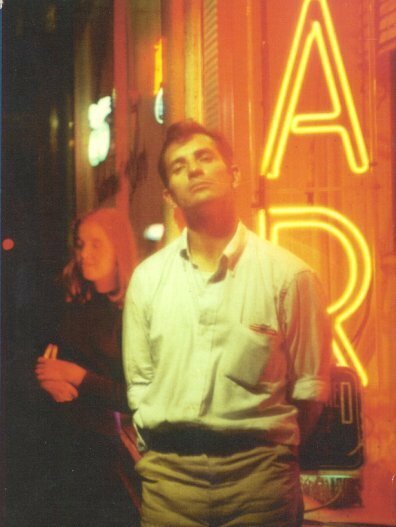 Enter the Gap's 1993 "Kerouac Wore Khakis" advertising campaign. The campaign drew on images taken in 1958, when Jerry Yulsman followed Jack Kerouac around Greenwich Village, taking pictures for Pageant Magazine. (See originals here and here.) 35 years later, Madison Ave. marketers airbrushed the images, stripped them of color, and, somehow found a way to graft onto stodgy pants, worn by desk jockeys nationwide, the illusion of freedom. That sleight of hand would make Don Draper proud. As for what happened in Kerouac's grave, we can only conjecture. We'll have more from the annals of commercializing the Beats tomorrow. It’s a shame, I guess. It’s the fault of the Sampas family. Let us notice that in his last letter to his nephew Paul, Kerouac advised him of the greedy hands “of those greeks”. On the other hand, it’s my impression that they have been generous to academic researchers. They tried to maintain the same myth that killed Kerouac. It’s a shame but they are human. I don’t know… Looking forward tomorrow’s article. Miiiilk it Gap, miiiilk it.